This is by far one of the best One-on-1 Exclusives that I’ve ever done! This edition features 24-year-old Richard Stevenson, Creator of the Radical Imagination Series. Richard is currently studying Education Policy, Leadership, and Advocacy at New York University, but is originally from Inglewood, California. 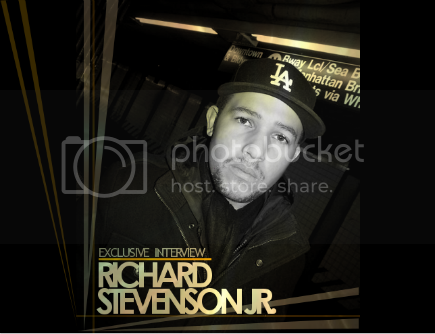 Richard is a perfect example of what it means to be “LivingTru“, he is a personal development mentor, a motivational speaker and he is currently planning to develop a center for family, and making efforts to build up the communities in Watts and the Southeast Los Angeles area. Please read on for a very inspirational edition of ONe-On-1! Richard it is truly an honor to have you! I’m a really big fan of your videos on Youtube, and I have a lot of questions for you! So, give me the background on the "Radical Imagination Series." How did it come about? The idea for the series was inspired by one of my favorite authors, "Robin D. G. Kelley. In his book, Freedom Dreams: The Black Radical Imagination." Kelley says that in order for a people to fight for freedom, justice, love, dignity, it must first be imagined. It must first be believed in order to manifest in our actions, our words, and our lives. I read it recently during a visit to LA, and really began to focus on how true to life this concept is. I’ve been fortunate enough to be surrounded by amazingly beautiful and talented artists and activists who inspire me on a daily basis. As we gather formally or informally, we have these conversations about our futures, our dreams, our realities, and together we build upon foundations of common interest to see change in our world. However, with all the distractions these days, it’s pretty hard to cut through all the noise and find a genuine, consistent, and progressive voice. This series is my way of opening up these conversations and amplifying the inspirational voice of people I know will change the face of the world as we know it. Through documenting our conversations and highlighting the ways we use our talents to inspire change, I was fortunate enough to end up with a project that I love and am excited to share with the world. That’s so awesome! That is exactly what the world needs, it’s so important to be reminded that our talents, though different can be used for a common purpose. What better purpose than changing the world? So, Richard one of the biggest changes we can make today is to really make it a point to empower our youth, what example would you like to set for them? I’m striving to show the youth through my words and, most importantly, my actions that it’s possible and necessary to devote their lives to making our world a better place using their talents and greatest passions. I speak openly and honestly about our history as a people, the obstacles we are facing, and what it means to be an agent of change. I also stress the immense feeling of pride and love that it brings. I think that’s critical because it prepares them for whatever comes their way. Too often our youth are lied to. Their obstacles are glossed over and when challenges arise, they are left to question themselves and doubt their own greatness, brilliance, beauty, and worth. So when I work with young brothers and sisters, it’s always straight talk, backed with love and trust in them that they can make anything happen. I want them to go on knowing that we can have a rewarding and fruitful life by listening to our hearts and allowing our passions and desire for justice to drive our direction in life. Such an awesome answer, I’m not going to talk too much Richard I’ll just keep going with the questions while you drop the knowledge (lol). What changes would you like to see in society as a whole, over the next 20 years? With all the crimes against humanity in our global community, too many people are going hungry, too many go without shelter or clothes on their backs, too many lack self worth and self love. And sadly, many of us in privileged positions are part of the problem. Simply put, I want to see many revolutions in our coming decades, revolutions of the mind, of the heart, and of society. All too often people cringe at the word Revolution. Revolution simply means Change. I want to see change in our ability to determine our forward direction, our wealth, our land, our education, our entertainment, and our environment. I want to see change in the way we think about and value our lives and each other. I’m looking to inspire change in all aspects of our lives just by getting us to imagine that a different way of living is possible if we first believe in it. I think it’s ridiculous how people who want progressive change are labeled radical. Change isn’t radical. What’s radical is the way in which countless people in our world are being forced to live without basic necessities and without respect. That’s radical. I hope to see a shift in the discussion around what change is needed in our world and I believe that this can be inspired through art and education. Agreed! I take it that the "Radical Imagination Series" is your own creative way of spreading that message. Your art, so to speak. With that said, what is your ultimate goal for The "Radical Imagination Series?" I’d like for these works to inspire conversations that grow into progressive social change. The series took absolutely nothing to start but a consumer camera, a little bit of time, and a vision. Plenty of people have great talent and brilliant things to say that inspire, so I hope some folks check the series out and say, “I can do that” or “I think so-and-so needs to be heard” and just continue the work of building collective consciousness through artful imagination and action. And of course draw attention to the masterful work being done by these artists. It feels great to go to the artists’ pages and see positive feedback from people that saw their episodes and commend them or reconnected with them because of the great work they are doing. I totally agree, we need more people to be positive examples. Not just for the Youth, but for mankind as a whole, we all need to be inspired. Now, I’d like to touch on the creative process for a sec, what motivates and inspires you as far as your creative vision goes? I am inspired by my experiences with so many dynamic people all at the first major crossroads in their lives. I’ve never been the person that was inspired by the polished professional with the classic success story. I’m more into learning about people during the unsure and most critical times of their lives. I need to see their reality, their challenges, and the decisions they make before they know anyone is watching. I am inspired when I can relate to someone’s humanity because it lets me know that even the most talented and dynamic of people are just like me and that I can be at least half as great as some of these people by embracing the things that make me who I am. This can be seen in my series. While I try to produce films that look and sound good, I take care to leave in the pauses, the stutters, the silent searches within their hearts as they weave together their responses. It’s the difference between reciting that rehearsed answer we all expect, and documenting an artist’s first articulation of something genuine and uniquely personal. Wow. Where does all this wisdom come from at only 24-years-old? (lol) You must’ve had great role models growing up, how does your family feel about your dreams and aspirations? Do they support you? I am fortunate to have a strong and loving family to support me in everything that I do. My family has always told me to do what I love. They stress that by finding fulfillment in my life and career, I will be able to do great things. They’ve helped me not to value money above happiness, self worth, or justice. And at every fork in the road, they’ve trusted me to make the right decisions. My friends are synonymous with my family. Their level of love, trust, and accountability is something that fuels everything that I do. I have some amazing brothers and sisters in my corner that keep me going through all my highs and lows. We’ve been through a lot together. I also have a strong and beautiful woman in my life that has challenged me to be the best man that I can be. It’s like a Dream Team. I couldn’t ask for a better group of people in my life. Beautiful! A great support system makes all the difference, regardless of what you choose to pursue. Speaking of family, were you raised in a religious household? What role does GOD play in your life? I work to speak a language of love that I think allows me to understand and vibe with people regardless of their faith. Which is why art is so special to me. There’s something very spiritual about artistic expression that allows the human spirit to communicate beyond borders, language, space, and time. I believe that one can be spiritual without necessarily subscribing to any one particular religious institution. I have been a student of a few different faiths and traditions through study and conversation. In looking at the histories of Islam, Christianity, Rastafarianism, African Spiritual Science, and others, I’ve found similarities in the messages and the inspirational figures that embodied love and justice. In developing my spiritual self, I look to building a lasting connection with the creative and loving spirit I recognize in all people and as well as with the earth beneath my feet. I know that on some deeper level I am working to address the spiritual imbalance in our global community that comes from the vast injustices. That’s deep, I’ve read up on different religions and I too have notice lots of similarities. I am Christian, but I respect everybody’s beliefs. I really admire your passion Richard, and like I said earlier it’s important for us as a people to inspire one another, so what advice would you give to someone who would like to spark a positive change, but doesn’t feel that they have the power to do it? To that person who doesn’t believe in his or her own potential, I would say that no start is too small. Most of what I know of mass movements began in homes, churches, and schools, just small conversations that took root and changed the world. Begin with jotting some ideas down on paper; start an e-mail thread, feed that hunger with relevant history; start with small conversations among friends and family; and above all, know that you are in good company by fighting the good fight. As rough as it can be sometimes, you’re never alone. You’re carrying on a legacy and struggle that began generations ago. If we tap into that history, it’s hard to ignore just how powerful and beautiful we really are. There are a lot of poisons out there that cause us to hate and doubt ourselves. We have to constantly feed and nurture our spirit physically, mentally, and emotionally to reach our potential. This is the very reason why I developed the "Radical Imagination Series." These are everyday good folks that boldly met the challenge to not only develop their talents and spirits, but to use them in order to spark positive change. I believe that every single person has limitless possibility to change our world. And I couldn’t have said it better myself! Thank you so much for your insight Richard! Hopefully we can keep in touch, and continue networking to spread the vision that we both share. Before we conclude the interview, I have two more questions for you. Do you have any new projects coming up in the near future, and what is your greatest ambition? As far as my future plans, I want to have the opportunity to teach and organize in the Southeast Los Angeles and Watts communities. Specifically, I’d like to teach at a local school and develop a community center alongside family and friends. Essentially I want this center to serve as a place for family and community building. I’d love to be able to organize with brothers and sisters there to strengthen the schools, social services, and physical environment in the surrounding neighborhoods. Pretty soon I will be kicking my planning for all of this into full gear. I’m excited but also a little nervous at the same time. History has taught me that there is always a risk in standing up, in speaking out, and in doing the right thing. In the long run though, I know our work will help us to see a better tomorrow. Richard, thank you so much for your time! I have to say that this is the most inspiring edition of ONe-On-1 that I’ve ever done. I appreciate your vision, and it’s so nice to speak with someone that shares mine! Hats off to you sir, (lol). You guys be sure to subscribe to Richard’s Youtube channel, and follow him on Tumblr! Check out this episode of the "Radical Imagination Series" by Richard Stevenson featuring one of my upcoming features Aaron Burleson! Ah, come on...I don't know anyone this young who is this insightful! This guy's got his head on right! Cool site! Cool article! Just cool! I am so very proud of you and your accomplishments in life! We need more people like you to step up to the plate and do it and mean it. I know that you will go far in life; a job well done. Your family has done a great job.